All fabrics are not created equal. Previously, we looked at COOL™ Modal, an inventive new fabric spun with a fiber blend developed by Samil. Today, we’re introducing DrySil®, another proprietary Samil yarn with a high-performance fiber blend that’s now available through Buhler. Offering truly superior moisture management, DrySil® wicks away moisture faster, dries quicker, and is more breathable than typical “dry” blends. While this alone is notable, DrySil® is also particularly comfortable, stable, pill-resistant, fashionable, and sustainable. Read on to learn what makes DrySil® so different, and why it represents a step up in innovative fabric engineering. A fabric’s performance and comfort largely depend on the physical properties of its fibers and construction. We’ve discussed this in detail in our post on the anatomy of comfort, and it’s precisely why it’s so critical for brands to involve their supply chain when creating new products. Part of what makes DrySil® so special is its proprietary fiber blend: 80% polyester and 20% TENCEL®, the latter being an extremely absorbent, sustainable fiber made exclusively by Lenzing. Most moisture-managing fabrics follow the same general model: a blend of hydrophobic (water-repelling, e.g., polyester) and hydrophilic (water-absorbing, e.g., cotton) fibers that together wick moisture away from the skin, towards the surface, to dry. As one of the most absorbent fibers on the market, it’s TENCEL® that takes DrySil® to another level. 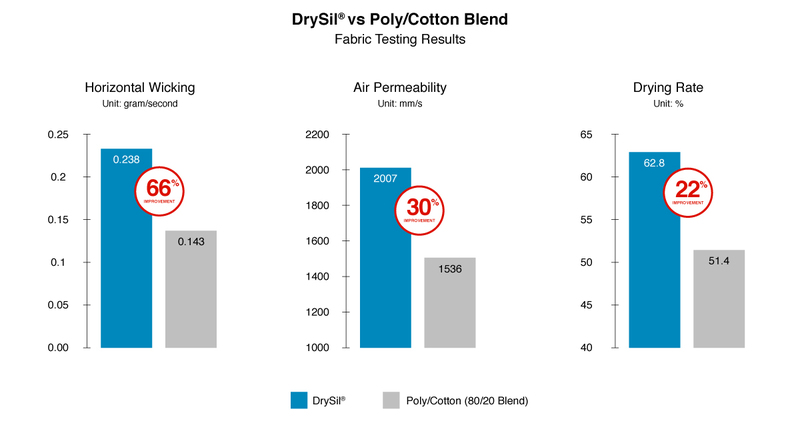 Compared to a 80%-20% blend of polyester-cotton, DrySil® wicks moisture 66% more effectively, dries 22% faster, and is 30% more breathable (i.e., air permeable). Other fabrics need to apply extra chemical additives to achieve the same effects. What’s more, chemicals degrade and fade after repeated washes. This degradation can do lasting damage to a brand in the eyes of the consumer, as the quality of the garment will rapidly fall after purchase. Another reason DrySil® is different is the way its yarn is spun. Made with Samil’s EcoSil® air-jet technology, DrySil®’s fibers are closely aligned, resulting in a less hairy fabric. Less hair means less pilling, greater absorption, less torque, and greater stability after multiple washings. And, because EcoSil® spinning is up to 30% more energy-efficient than traditional ring spinning, it takes much less power to create the product. Plus, we can pair it with more eco-friendly fibers, including recycled polyesters, Lenzing TENCEL®, Supima® cotton, and linen. All of this adds up to a smaller carbon footprint. As we’ve demonstrated, the smallest details of a fiber can make huge differences in a brand’s final garment. These differences create strengths and weaknesses that lend themselves to certain applications. DrySil®’s unique moisture-wicking properties, for example, make it an ideal fabric for athletic-wear, underclothes, underwear, and socks. By working with the experts at Samil and Buhler, apparel brands can make fiber and fabric decisions that meet their goals for function, performance, and price. Contact us today to see how our expertise will help your brand to create the next innovation in apparel.